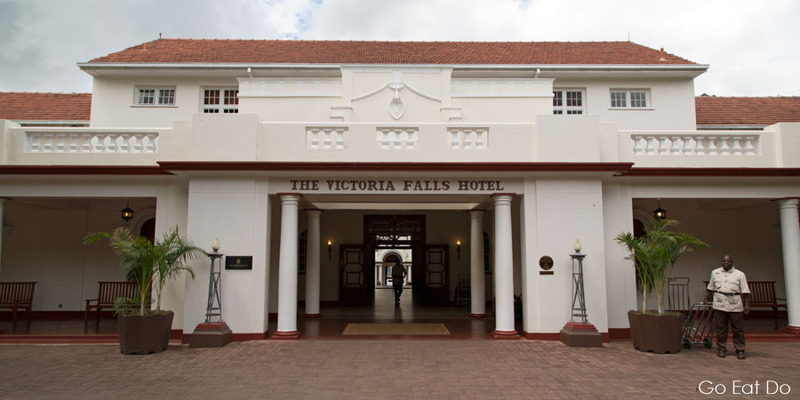 The Victoria Falls Hotel offers luxury, colonial-style accommodation within easy walking distance of the Victoria Falls on the border of Zimbabwe and Zambia. The hotel garden and Stanley’s Terrace provide views over the Victoria Falls Bridge’s iconic arch and the misty spray that rises from the Victoria Falls. This five-star hotel, a member of The Leading Hotels of the World, unashamedly embraces the property’s and region’s colonial heritage. Framed photos show scenes from Southern Rhodesia’s history. Cartoons on corridor walls and gilt-framed royal portraits in the hotels public rooms convey snapshots of history from the era when the Victoria Falls was part of the British Empire. If you enjoy history then plan plenty of time to mooch about the hotel corridors and public spaces: there’s lots to see. Entrance of the Victoria Falls Hotel. The 161-room hotel opened in 1904: just a couple of years after the British Empire and Boers of southern Africa had clashed in bloody conflict. The premises were established to provide luxury accommodation overlooking the arched bridge spanning the River Zambezi. Cecil Rhodes envisaged the bridge as a key element in a railway that would link Britain’s imperial outposts all the way from Cairo to Cape Town. Despite the subsequent passage of more than a century, and marked changes in the country, the hotel building is still owned by the National Railways of Zimbabwe. View of the Victoria Falls Bridge from the garden of the Victoria Falls Hotel. From the moment I arrived at The Victoria Falls Hotel it was evident that this place plays upon its colonial heritage. The doormen wear white pith helmets and tunics with shining buttons. One of the most photographed members of staff, Duly, wears an impressive collection of pin badges on his uniform. Presumably many have been gifted to him by guests visiting from around the planet. Artwork for sale in the Larry Norton Gallery at the Victoria Falls Hotel. Artwork on the wall of the porch of the hotel is accompanied by a brief explanation that Victoria Falls became known as ‘Jungle Junction’ during the early decades of aviation travel. That’s now the name of the hotel’s courtyard restaurant, where vast breakfast buffets are laid out. The dinner buffet is accompanied by traditional dancing and music. The international cuisine served at Jungle Junction includes succulent grilled crocodile tail (you’ll have to visit to ascertain whether you think the rumour that it’s like chicken is true — I didn’t think so). Jungle Junction frieze at the entrance to the Victoria Falls Hotel. After watching the dancing and gorging on crocodile I retired to a seat on Stanley’s Terrace (where afternoon tea is served earlier in the day) for a gin and tonic. Realistically, what else could I order, given colonial décor of Stanley’s Bar and surroundings? Another, it transpired. As I sipped my drinks an electrical storm flashed in the night sky above the illuminated arch of the Victoria Falls Bridge. The lightning in the night sky may have been negatively charged but the setting as a whole made a positive impression. The colonnaded courtyard garden of the Victoria Falls Hotel. Antelope horns adorn the walls of the Bulawayo Room like giant, wall-mounted double corkscrews. The zebra hides and animal heads that record the kills of big game hunters of decades ago might not, in modern society, be to everyone’s taste but here they don’t seem out of place. Being in The Victoria Falls Hotel is, in the most positive sense of the expression, like stepping inside a living museum or onto a movie set. The uniforms and polite manners of staff seem, to some degree, as if from decades ago. Swimming pool at the Victoria Falls Hotel. My bedroom (room number 212) opened onto a colonnaded courtyard. It was spacious, had a desk, featured a sofa and coffee table, and had two beds over which mosquito nets were hung. (Malaria is still an issue in the Victoria Falls region and my doctor urged me to use a combination of anti-malarial tablets, insect repellent and a mosquito net while sleeping.) The draped beds looked romantic but the nets still have a practical function. 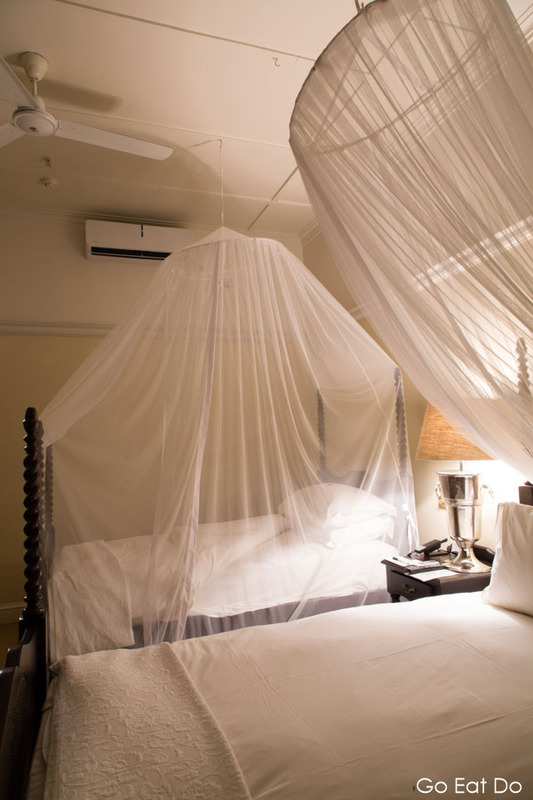 Mosquito nets in use in a bedroom at the Victoria Falls Hotel. In addition to a traditional ceiling fan the room had air-conditioning plus the mod-cons of an electric combination safe (large enough for a laptop) and a wall-mounted, flat-screen television. With so much else to occupy me in the hotel, including a pre-bedtime steep in the clawfoot bathtub, I never got to turn on the telly to check whether it’s possible to view Zambian channels in Zimbabwe. The Victoria Falls Hotel is one of those places that you really should go out of your way to visit for a drink or a meal even if an overnight stay is beyond your budget. If you can afford to stay at the hotel then do so: it provides a sense of the Victoria Falls’ heritage. I found it a thoroughly pleasant place to stay and a hotel that’s easy to recommend to lovers of luxury. Colonial chic…an Edwardian style room in the Victoria Falls Hotel. The Victoria Falls Hotel (1 Mallett Drive, Victoria Falls, Zimbabwe; tel. +263 213 2844 751) website has information regarding room rates, details of the room categories and links to online booking. Discover more about the surrounding region on the Go To Victoria Falls and Zimbabwe Tourism Authority websites. Photographs illustrating this post are by Why Eye Photography. Specialising in food, travel and portrait photography, Why Eye Photography is available for commissions across the United Kingdom and beyond. An ideal place to sip a G and T? Garden and terrace of the Victoria Falls Hotel. Disclosure: Stuart visited the Victoria Falls during a tour hosted by the Zimbabwe Tourism Authority. Wow what a stunning place! Would love to visit one day! Hello Catherine, It’s a lovely place and one of those hotels that warrants spending time on the premises.